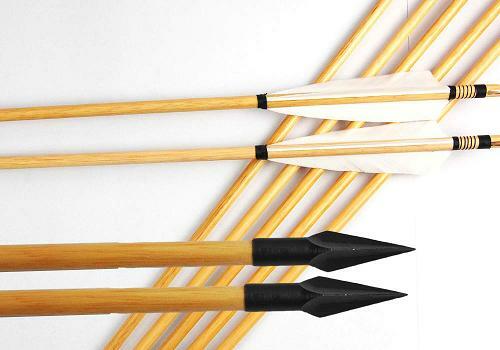 Arrows are essential equipment in the sports of archery and hunting. They typically consist of a shaft with an arrowhead attached to the front end and with fletchings and a nock attached to the other end. Some arrows has a sharpened tip on the shaft which serves as the arrowhead while others have separate arrowheads made usually from metal, stone or ather hard materials. Shafts are typically composed of solid wood, bamboo, fiberglass, aluminium alloy, carbon fiber, or other composite materials. Fletchings are traditionally made from feathers but this sheets of plastic are common in modern arrows. Because arrow shafts can bend or break and the sharp arrowheads can damage and injure, aroows must be properly packed prior to shipping to ensure that they arrive in good condition without maiming hapless shipping personnel. Here are tips on how to properly pack and ship arrows. Wrap each arrowhead with bubble wrap and secure with rubber band or tape. Extra shar heads must be covered in carbord or paper first before bubble wrapping to prevent it for piercing through the box or damaging other items. Depending on the number of arrows you are shipping, you may use tube mailers or even cut-to-size PVC tubes with plastic dics taped on both ends. Use pieves of bubble wrap to prevent the arrows from shaking inside the container. Secure the package with tape. Address and label the package as you would any other shipment. You can also ship arrows in a quiver and box it with ample packing materials on all sides to prevent movement.